Although I don’t weave them all that often for my scarves & shawls, I do love a complex twill weaving pattern. I modified the gebrochene pattern I wove last year. Except last year I wove it in 20/2 silk; this year I’m using 30/2 silk. My post from last year incorrectly said the 20/2 was about 8,000 yards per pound (ypp)- it’s really about 4,500 ypp. The 30/2 silk I’m using this year is 7,500 ypp. I got the silk beamed, heddles & reed threaded, tied on to the front apron. I wove and hemmed the front edge – only 1 reed-threading error, so not bad to fix. 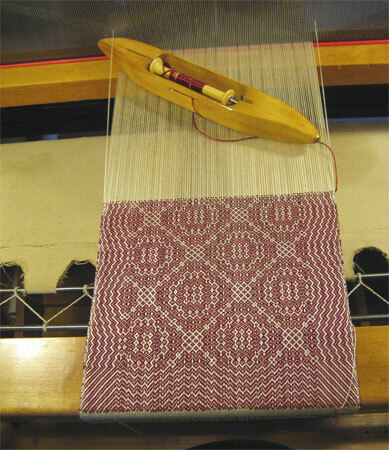 Then I wove the first pattern with my weft – POO!! About 1/2 the warp was threaded wrong! I had to unweave the 4″ and start again. Rethreading was worse than threading. Why? My loom wasn’t all ‘unfolded’ the way it is when I’m threading. Unless I unthreaded the correct half of the reed, I had to work around it. Next time I’ll unthread the reed – I’m sure it’d be both quicker and easier than what I did. Anyway, finally got it all back, threaded correctly, and started weaving again. Here it is after weaving a few patterns motifs. As always, I’m not happy with the color. Now let me talk about the weft for a minute. A few years ago I bought some tram silk. I tried weaving with it…not overly successfully. Not an experience I was eager to repeat. Sandra Rude posted about working with tram last month, and I was encouraged to try again, this time using it only as weft. I knew for my gebrochene to look right, I had to use a weft that’s roughly the same size as the warp. But I don’t own a McMorran balance – a tool that determines the ypp of yarns. I remembered seeing directions for making one online somewhere, and googled a bit till I found these instructions. I made one with a bamboo skewer and some yarn and it worked like a charm. I found out that my ruby tram silk is roughly 30,000 ypp. It takes 4 feet of this to balance 1 foot of 30/2 silk. How would I cope with this? I don’t spin, and had asked one of my guild-mates to spin some up for me, but he said it wasn’t worth it. I tried getting it machine spun at the Fiber Factory, but it was too fine for their equipment. So, using a modifier a friend made me, I wound some of the silk onto 4 of the cardboard cones from the 8/2 babywrap cotton. Then I stood all 4 cones up and wound a bobbin from them, careful to wind slowly and with even tension of all 4 threads. It isn’t ideal – a twist in it would be better – but it works. And I just love the sheen of the tram. 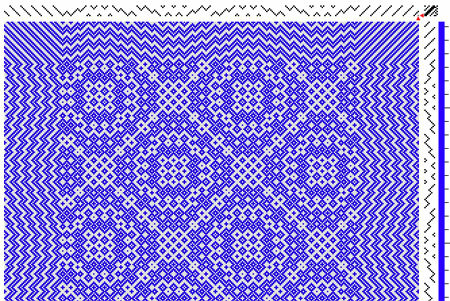 Here you can see both the top and bottom of the pattern. I’m going to use another of the trams for the second scarf on this warp. When I have time, I’d like to weave some shawls out of this pattern. But maybe in 20/2. But then I can’t use my tram. Decisions, decisions.